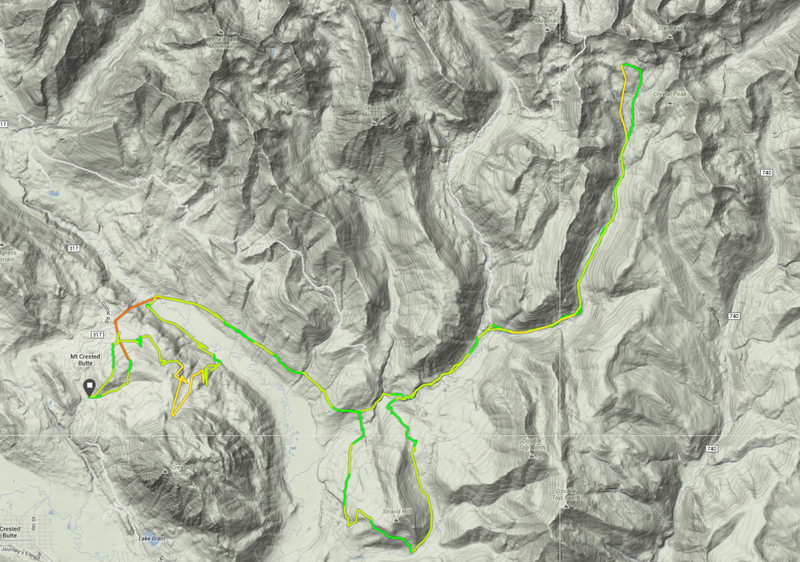 Another Elk Mountain Grand Traverse has come and gone. The annual 40 mile ski race from Crested Butte to Aspen has become a rite of spring for Christy and me, we’ve done it 13 of the 17 years it’s been held, the last seven as a couple. We’ve always loved the event and we’ve encouraged anyone who’s curious to check it out. Unfortunately, for the 3rd time in the history of the race the conditions up high were deemed too dangerous for it to follow its intended course to Aspen. There was a lot of snow and wind in the days before and to send 400 people (200 teams of two) through avalanche terrain in the middle of the night would have been irresponsible. 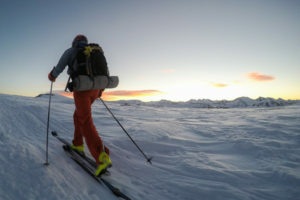 We can all respect a decision made in the interest of safety, so the alternate course now dubbed the “Grand Reverse” was implemented and those of us that stuck around skied in and around Crested Butte. It wasn’t our first time on the Reverse course. We did it as a team the last time conditions warranted it, five years ago (2010). I even participated when the first Reverse was called back in 1999, when the GT was only in its second year. It’s too bad that 15 years later it’s more or less the same boring course. It was disappointing to not be able to complete the intended route, but we were there and it was paid for so we decided to make the best of it. At least the East River Valley section wasn’t a dry hike this year. The course map. Click to enlarge. On my watch it measured 41.36 miles with more than 8,200 feet of ascent and descent. It was the flattest 8000 feet of descent I’ve ever experienced- it almost defied the laws of physics because I felt like we only made a few actual ski turns all day. We did alright, finishing 3rd overall in the Coed division. That’s great with us. We executed some things better than in years’ past but underperformed elsewhere, which is what I love about these long events— once they’re done you always come to learn ways you can do things better. And that also goes for the race and its organizers. They can do better. Being mindful of the effort involved to make something like this happen, I still feel the need to insist that they do better. Our observation from the weekend was that the race experience left much to be desired and many participants we know were considerably disappointed, to put it mildly. Christy and I left the race feeling let down. First and foremost, the Reverse course should be scrapped and a new alternate course be laid out. The Reverse is a complete dud. It’s full of pointless extra miles and vertical, is technically dull, and offers almost no actual skiing. Hundreds of participants train all winter and travel far to get there (not to mention pay a lot of money) and they deserve better. 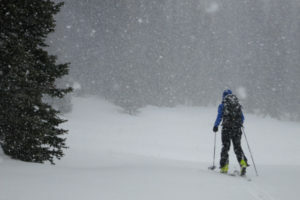 Crested Butte is fortunate to have a lot of accessible backcountry, and since it’s certain that bad weather will force an alternate route again in the future the race should provide a better Plan B. Perhaps a route that warrants all the gear we’re required to carry? That’s not just our opinion— five of the six top male finishers from last year, all from out of town, packed up their things and left when the news of the Reverse was announced. But the Reverse course wasn’t the only disappointment for us. A couple of other things we heard and saw need to be mentioned. At the pre-race meeting when news of the Reverse was announced, a participant asked if a map of the new course would be made available. He was told there wouldn’t be one. Christy and I knew the gist of where we were going, but I estimate that more than half of the field had little idea. I don’t see how that decision can be justified. When the topic shifted to racer support on the course, we were told Friends Hut would provide 16 oz. of water per person. One participant inquired about additional support, more specifically about soup, and was told “You have a stove.” Normally water is also provided late in the race at Barnard Hut and everyone makes use of it. But for this race, if you were one of those unfortunate non-elites or first timers who aren’t so fast so as to finish before your bladders run dry, you were told to melt your own snow. 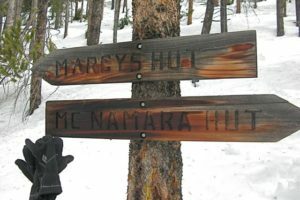 There were ample locations along the course that were both accessible by snowmobile and surrounded by snow or near a creek. There are normally two aid stations so why cut back to just one? Worse yet, despite assurances otherwise, it was reported that Friends Hut only offered a mere 2 oz. of water to the racers who asked. For $400 a team they effectively offered nothing in terms of support. We were told the race times would be between 6:45 and 11 hours. Christy and I finished the 2010 Reverse in 8:45 so we figured we’d be in around the same time. We were also told there would be no cutoff times. Well, they added miles and vertical without telling anyone and times were a lot slower than anticipated. We ended up needing 11 hours to finish. And sometime mid-race it was determined that because it was taking so long for some there would be a cutoff. Back-of-the-pack participants were unexpectedly informed their race was over when they didn’t make the Strand Hill junction by a certain time. They were given a DNF despite being initially told they had all the time they needed. Proper planning could have prevented that. These comments are meant to be constructive. The race needs to be more mindful of the average participant— the back-of-the-pack guy, the first time participant from out of town. It also needs to be better prepared for unpredictable March weather. 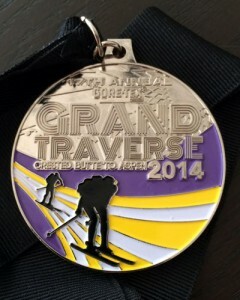 The Grand Traverse is a mature event now, spanning almost two decades. It’s lucky that it has a reliable fan base including ourselves, but that doesn’t mean they can afford to stop innovating or working to improve the race. It’s not the hardest, or coolest, or most fun race out there. Nor is it the only one. It’s just another race among many, and with so many events to choose from these days, people who have a bad experience will simply not come back. Very well done and thought out post Ted.I’m slowly trying out more winter activities,besides my fav,snowshoeing with mutts,so an event like this would be a nice goal to try for.The Grand Traverse Website seems very informative and well done,and great sponsors,but you’re right,even a back-up plan for a race has to be well planned and executed,especially if a noob like me was out there.Hope they send out questionnaires to improve on their race,a back-up plan is never ideal,but hey,it’s Colorado,it can still be awesome if it’s professionally managed.Congratz on Ted’s and Christy’s excellent adventure! One last comment on this Ted,(than i have to get out,dogs are restless! ),but this happens to both long established events,and people also,dare i say the word,COMPLACENCY.There,i said it,(you can delete that word if it’s too offensive to you and your readers!). Randy, you’re right. Complacency happens, but things can always be made right. I look at the current situation at the LT100. The race didn’t have a good handle on things last year and it didn’t go unnoticed. I’ll be curious to hear what changes they implement over there this year. I’m pretty sure with your experience with the “long day”, after 15 or however many Hardrocks, the GT would be a relative stroll. In any conditions. Quit sandbagging and get a pair of skis.